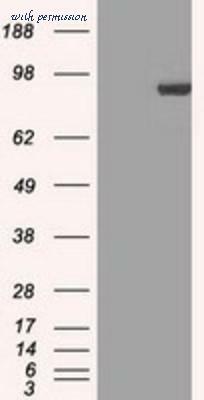 The STAT1 antibody from Proteintech is a rabbit polyclonal antibody to a recombinant protein of human STAT1. This antibody recognizes human, rat antigen. 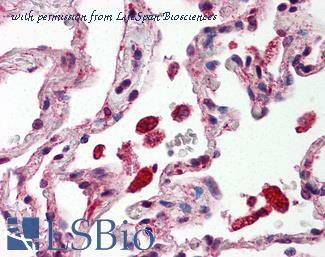 The STAT1 antibody has been validated for the following applications: ELISA, FC, IF, IHC, IP, WB analysis. 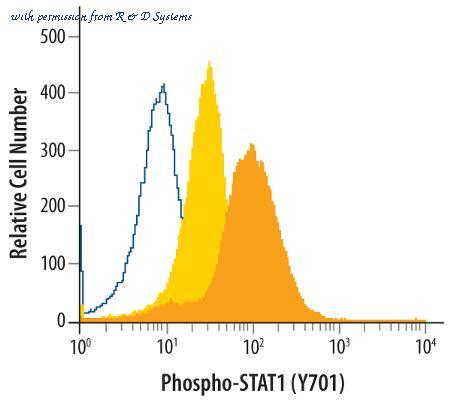 Detection of Phospho-STAT1 in IFN-alpha-treated Daudi Human Cell Line by Flow Cytometry. 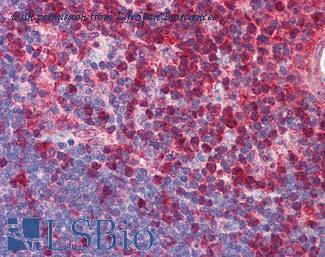 Daudi human Burkitt's lymphoma cell line was unstimulated (light orange filled histogram) or treated with 500 units/mL Recombinant Human IFN-alpha (Catalog # 11100-1 ) for 20 minutes (dark orange filled histogram), then stained with Rabbit Anti-Human/Mouse Phospho-STAT1 (Y701) Antigen Affinity-purified Polyclonal Antibody (Catalog # AF2894) or control antibody (Catalog # AB-105-C, open histogram), followed by Allophycocyanin-conjugated Anti-Rabbit IgG Secondary Antibody (Catalog # F0111 ). To facilitate intracellular staining, cells were fixed with paraformaldehyde and permeabilized with methanol. 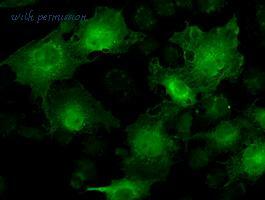 STAT1 in HeLa Human Cell Line. 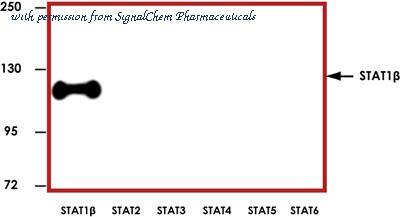 STAT1 was detected in immersion fixed HeLa human cervical epithelial carcinoma cell line using Rat Anti-Human STAT1 Monoclonal Antibody (Catalog # MAB1490) at 3 ╡g/mL for 3 hours at room temperature. 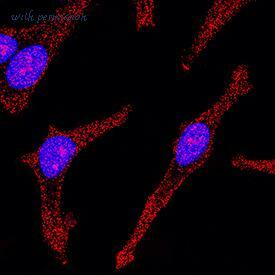 Cells were stained using the NorthernLightsÖ 557-conjugated Anti-Rat IgG Secondary Antibody (red; Catalog # NL014 ) and counterstained with DAPI (blue). 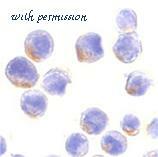 Specific staining was localized to cytoplasm and nuclei. View our protocol for Fluorescent ICC Staining of Cells on Coverslips . 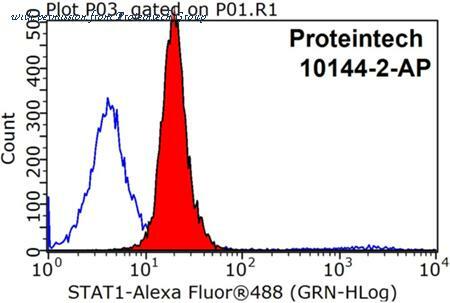 Detection of Human and Mouse STAT1 p91 by Western Blot. Western blot shows lysates of Daudi human Burkitt's lymphoma cell line, HeLa human cervical epithelial carcinoma cell line, and NIH-3T3 mouse embryonic fibroblast cell line. PVDF Membrane was probed with 1 ╡g/mL of Goat Anti-Human/Mouse STAT1 p91 Antigen Affinity-purified Polyclonal Antibody (Catalog # PAF-ST1) followed by HRP-conjugated Anti-Goat IgG Secondary Antibody (Catalog # HAF109 ). A specific band was detected for STAT1 p91 at approximately 91 kDa (as indicated). This experiment was conducted under reducing conditions and using Immunoblot Buffer Group 1 . Immunohistochemistry-Paraffin: STAT1 Antibody (4H9) [NBP1-48011] - Staining of paraffin-embedded Human endometrium tissue using anti-STAT1 mouse monoclonal antibody. 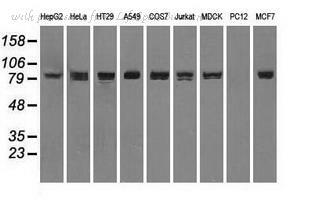 Western Blot: STAT1 Antibody (4H9) [NBP1-48011] Analysis of extracts (35ug) from 9 different cell lines by usin g anti-STAT1 monoclonal antibody (HepG2: human; HeLa: human; SVT2: mouse; A549: human; COS7: monkey; Jurkat: human; MDCK: canine; PC12: rat; MCF7: human). 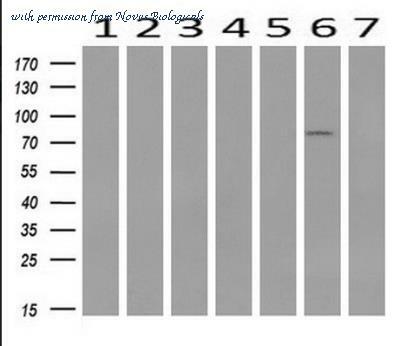 Western Blot: STAT1 Antibody (4H9) [NBP1-48011] - HEK293T cells were transfected with the pCMV6-ENTRY control (Left lane) or pCMV6-ENTRY STAT1 (Right lane) cDNA for 48 hrs and lysed. Equivalent amounts of cell lysates (5 ug per lane) were separated by SDS-PAGE and immunoblotted with anti-STAT1. 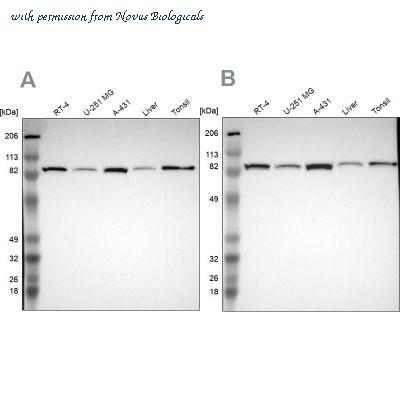 Western Blot: STAT1 Antibody [NB100-56314] - Western blot analysis of STat 1 in HeLa cell lysate using NB100-56314 at 1 ug/ml. 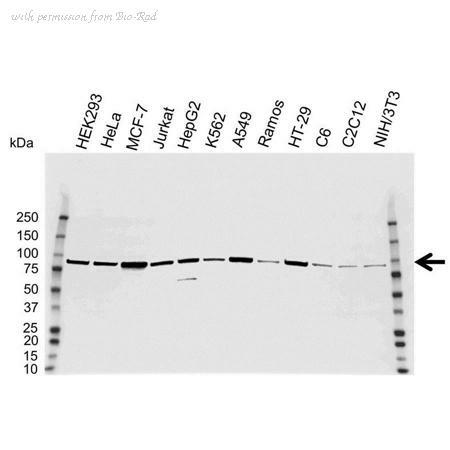 Western Blot: STAT1 Antibody [NBP1-81578] - Analysis in mouse cell line NIH-3T3 and rat cell line NBT-II. 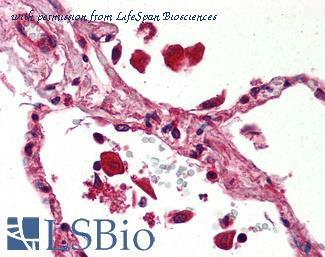 Anti-STAT1 antibody IHC of human lung, alveolar macrophages. Immunohistochemistry of formalin-fixed, paraffin-embedded tissue after heat-induced antigen retrieval. Antibody concentration 5 ug/ml. 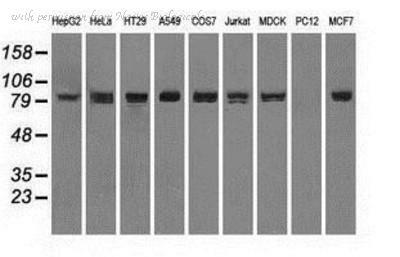 Western blot of extracts (35 ug) from 9 different cell lines by using anti-STAT1 monoclonal antibody. 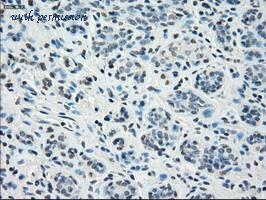 IHC of paraffin-embedded breast tissue using anti-STAT1 mouse monoclonal antibody. (Dilution 1:50). Anti-STAT1 mouse monoclonal antibody immunofluorescent staining of COS7 cells transiently transfected by pCMV6-ENTRY STAT1. 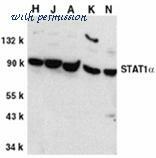 Western blot analysis of various cell lines using STAT1 antibody. 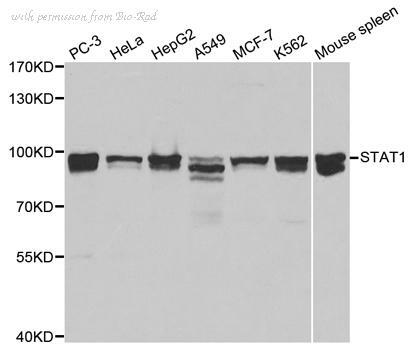 Western blot analysis of STAT1 alpha in whole cell lysates from HeLa (H), Jurkat (J), A431 (A), K562 (K), and NIH3T3 (N) cells, with STAT1 alpha antibody at 1µg/ml. Immunocytochemistry analysis of STAT1 alpha in HeLa cells with STAT1 alpha antibody at 10µg/ml. Western blot analysis of untreated (1), EGF stimulated (2), or pervanadate treated (3) A549 cell lysates with Stat1 (pSer727) mAb, clone 12C5. 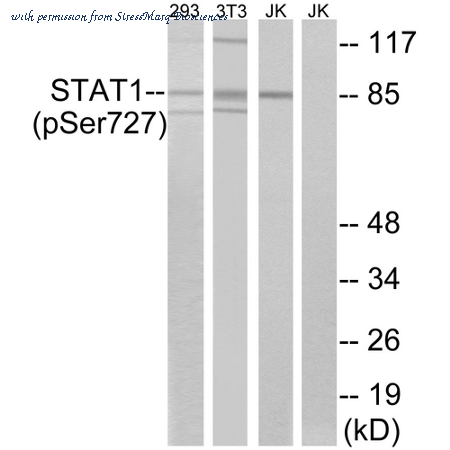 Western blot analysis of Human, Mouse Embryonic kidney epithelial cell line (HEK293), Fibroblast cell line (NIH 3T3) lysates, Jurkat cell lysates showing detection of ~87 kDa STAT1 (pSer727) protein using Rabbit Anti-STAT1 (pSer727) Polyclonal Antibody (SPC-1430). Lane 1: HEK293 cell lysate. Lane 2: NIH 3T3 cells treated with UV (15 min). Lane 3: Jurkat cells treated with Etoposide (25 uM for 24 hours). Lane 4: Jurkat cells treated with Etoposide (25 uM for 24 hours) and STAT1 (Phospho-Ser727) antibody blocked with immunizing peptide. Load: 10 µg. 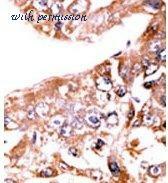 Primary Antibody: Rabbit Anti-STAT1 (pSer727) Polyclonal Antibody (SPC-1430) at 1:1000. Predicted/Observed Size: ~87 kDa. 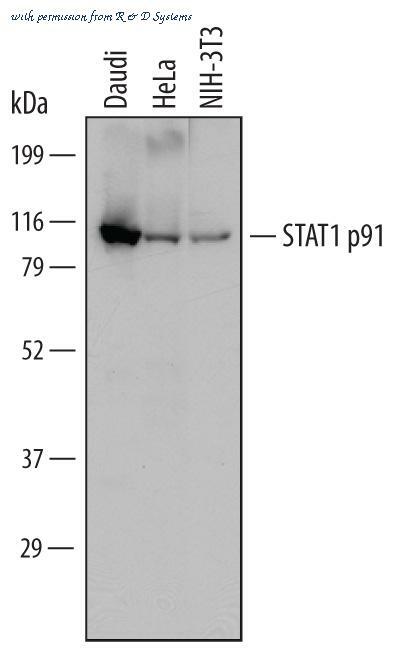 Representative western blot with Anti-STAT1β (1:1000) using 20 ng of GST-tagged human recombinant STAT1β, STAT2, STAT3, STAT4, STAT5, and STAT6. 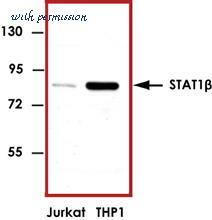 Representative western blot with Anti-STAT1β (1:1000) using 30 μg of Jurkat and THP1 cell lysate.